Part One of a Two-Part Interview with Claudia about some of her experiences with sharks. Nel: Most people are so afraid of sharks. Fear stops many people from going into the sea at all. I wondered whether you can remember ever being afraid of sharks. Claudia: Look, that’s a strange question because everyone is afraid of something. I really hate crocodiles. I once saw one— you know, when they lie in the sand to collect the heat from the sun? And then, when they get up, you can see how high they are, up on their legs. Then they start running! I was glad it was just a documentary on television because it made my skin crawl. I hate them. I don’t know why, but I do. South African Crocodile. Photo by Jean Wimmerlin. The other animal I’m afraid of is a horse. My grandmother got hit by one, kicked by a horse. They had normally placid horses, they call them cold-blooded ones. I don’t know what happened. The same thing happened with the cow once, when she tried to milk it. She was sitting on this traditional little stool that has just one leg, that you strap around you and balance on. She flew, with the stool still on her, off into the corner of the shed. I’m afraid of cows, too. But I can’t let that stop me. Otherwise, I’d never go for a walk through the meadows or the forest, or, you know, into a stable. I do always keep my distance from crocodiles, cows and horses. I might get closer if there is a fence in between. That doesn’t apply to crocs though, because I don’t trust a fence with a crocodile. Obviously, there is no fence in the ocean. I feel differently about the Ocean. The sharks and all the other fish and animals were there long before the humans came. You’re a guest and you should behave like one when you go there. I’ve never been afraid of sharks. They are among the most elegant swimmers in the ocean. There are some exceptions. The Great White has got a face that only a mother could love. I would not like to see that. And I would not think that it’s an adventure to sit in a cage to face that ugly thing. Other people might say it’s beautiful, but then, they love their children, too (who knows how they look). A real adventure would be if you go in the cage and the shark is already in there. That could be a life-limiting venture. Anything else is not really an adventure. People go for an adrenaline kick: swimming in murky water where they try to attract the sharks, you know, with fish blood. Fish blood is different to human blood. Some people think if they’ve got a scratch, ‘Oh, my god, sharks are coming now.’ It’s not quite true. Human blood is a different chemical mixture and sharks are not really attracted by that. N: But you went out specifically to see sharks when you worked as a diving instructor in the Maldives? C: Yes. As part of that job, I was taking people out very early in the morning to see the hammerhead sharks when they came back from hunting. They go out hunting in the night and when they come back in the morning there are several points in the ocean of this planet, where you can see them at a certain time. Hammerhead Shark. Photo by Took. It’s not about the clock. It’s about the sunlight coming up through the water, or a different current moving in. It was out in the ocean, away from the reef. N: Can you tell me, before you went there: I know you worked very long hours when you were working as a diving instructor. I know management had you working 'til late. I’d imagine that if you’re going out before sunrise there would have been preparation to do beforehand. I wonder how much sleep you got on those nights. C: Of course, if you work as a diving instructor, management tells you, ‘These are your guests and you have to entertain them’. It doesn’t matter if you’re up at 6.30 every morning and they can sleep in, normally. You’re approached by guests even if you sit in the restaurant having a quick lunch. So, I mostly skipped lunch. You know, sometimes you need a little break. I prepared equipment, did repairs, wrote bills or gave theory lessons. When other people had lunch I’d have one or two of the little bananas they have. I used to have quite a few cigarettes with my banana lunch. Not very healthy, I know. Kept me going. That’s how I prepared for these trips. I always refused cocktails. Which management didn’t appreciate because they made a lot of money on cocktails. For me, they always sounded like a headache, because of the odd mixtures. A headache in a glass. Photograph by pasja1000. Sometimes, I would have a cocktail that was just juice with cream and fruit in it, without the alcohol, because people couldn’t tell what you were drinking. Sometimes I’d accept a beer. At the end of the night, I’d sign a bill for eighteen beers, or so. I would drink one of them, sometimes two. N: So the guests paid for eighteen beers and you only drank one? C: Well, you have to toast with a full glass. I’d put the full glass down behind the counter and pick up the half-full one I was sipping from behind there, too. Say, ‘Cheers,’ put the full one back and pick the other one up to drink. Otherwise, you could not function.Two glasses parked behind the counter and the guests paid for new ones. N: And you just enjoyed the friendly thought that they wanted to buy you a beer? C: Yes, that’s right. Of course, there are people out there who are kind of thirsty, but those kinds of drinks were very expensive there. Some colleagues would just drink whatever they could since the drinks were free. We had a blackboard outside the diving school, where people put their names up for the trips they wanted to join. I’d check the blackboard in the evening, so I knew how many people would go and I could prepare the tanks for the boat and write the lists. In the mornings, you had to look for the boat crew, to make sure they were there. You had to check that there was enough diesel in the boat tank. Fortunately, it was not my job to put diesel in the tank and prepare the boat, but I had to make sure it was all working. I was responsible. There are koel birds that make a peculiar call before sunrise in the tropics. It was a loud call. I’d get up and get myself a coffee. I had a little water kettle and instant coffee in my room. I opened up the diving school. It was pitch black when I got up, but you knew when you heard these birds that the sun was coming up soon. N: How did you know where the right place was? C: Well, it was kind of a secret. You had to use your thumbs, or your two-finger method, to check out the distance from surrounding islands. [She holds her thumb and fingers up like an artist assessing the relative size of elements of her distant subject]. Then you jump in the water, land just above the reef. Then swim away from the reef out into the deep blue water, to a certain distance and at a certain angle. N: You were diving with experienced divers? C: Yes, it was not for beginners. N: They’d done night diving before? C: It wasn’t a night dive because the moment you jump in the water the sun began to rise and it got brighter and brighter as you swam. It was only experienced divers that we took. Or sometimes there was one that wasn’t so experienced, that I kept right with me. In the briefing before people went in the water, I would tell them, ‘You jump in the water and you have not filled your BCD.’ That’s your buoyancy device. C: That keeps you buoyant, that’s right. So, you jump in and go straight down to the reef. Because if you wait on the surface, the current might take you somewhere else. You know, the current on the surface was going in a different direction than it was at ten metres. People had to stay with their partner, their dive-buddy, but then also together in a group. The sharks come at a particular position. I knew instructors from other places. Same time, same spot they went in the water, but they went the other direction and did not see a thing. One of those groups saw a turtle once, but no hammerhead sharks. 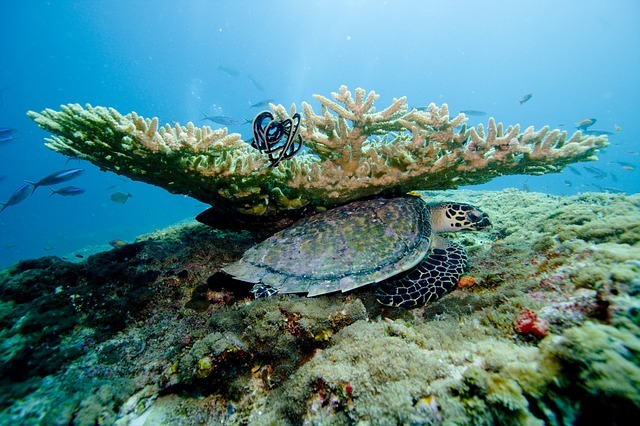 Superb visibility is possible in the right season, diving in the Maldives. Photo by kormandallas. The fascinating thing for me—I did love the sharks—but the more exciting thing for me was seeing these metallic blue plankton, like flakes. They reflected the light. You were surrounded by blue, with these shiny little dots in it. It was a bit like floating in the Universe. N: Were they all blue? C: They had a bluish iridescence. N: What depth did you take people to? C: A maximum of thirty metres. But sometimes we were only ten metres down. In the season with great visibility, it was fantastic. You could see them coming, from a long way away. I could see them, my colleagues too, quite early. They have a distinctive shape. When hammerheads approach they don’t look like sharks. Because of their funny shape, you see a little white stripe or something. Hammerhead sharks at Cocos Islands, Costa Rica. Photo by Barry Peters via wikimedia. N: They swam over your heads, or—? C: Sometimes they passed us on the side. Or both sides. Or they might swim above or below. When they swam below you couldn’t see much because they were grey on top. The water was dark blue. There could have been hundreds—sometimes there were hundreds—but you could see them only if they were not too far down. You can’t imagine how quickly they disappear into the depths. From the side, you could see this whitish stripe they have on their side. And of course, when they’re above you, they are white on the bottom, so they are easy to spot. N: Hammerheads have got a distinct shape that you could see clearly if they were over your head. C: Yeah, but even when they are below or to the side you can see what they are clearly when they are closer. They have a certain way of swimming because their eyes are so far apart at the ends of their heads. N: Having people in a group was the best way you could have your people in a place where they might get to see the sharks? N: But you couldn’t predict how deep the sharks were in the water? C: No, you could not predict that. It depended on the climate, the visibility, the current, all sorts of things. Sometimes there’d be four (that were visible). Sometimes it was a hundred, a hundred-fifty. Sometimes they were everywhere. Sometimes you could clearly see them far below. N: How did you feel when the sharks approached the group? C: You know, they hunt in groups. They’re coming back from hunting at that time of day. So, they looked content and satisfied. They were not disturbed by anything. They just swam by elegantly. N: You were not afraid when you saw them coming? But, you don’t wanna see a single hammerhead in the daytime on the reef. I had that a few times. It might have a problem. N: You don’t want a shark with a problem. C: They’re looking for easy prey. There are lots of fish there. If you think about it, you are the same size as the shark or not much smaller. So you are not really easy prey. They go for the fish. We had to do our safety stops on the way up from the dive, which were fantastic too, with the rays of sunlight coming through the blue water. The sharks were gone already. Sometimes you were drifting toward the reef and could see all the colourful little fish. Occasionally there was one last shark that was a bit slow. If you’re hanging in four or five metres of water, it would freak you out when a shark came close to your head. Surprisingly, it was mainly men that freaked out. It was a thrill for them to see the hammerhead sharks. It was an adventure for them. After the adrenaline rush, they thought they were safe closer to the surface. But if you are stopped at five metres and a hammerhead shark goes above you on the surface it can change your mind. The shark was very close.